Participating in a trade show in Boston, MA requires creative planning to fully take advantage of all these events have to offer. However, when they are not properly implemented, they can be a waste of time and money. Trade shows are your chance to boost lead generation and sales. This means that the trade show booth must be well designed to fully use it to it's potential and to compliment your marketing plan. A trade show display when well designed can garner great leads, which, when handled properly can be cultivated into sales. Booth ROI is a given when the display is creatively well designed. In order to ensure your ROI, a concrete marketing plan needs to be put in-place along with promotional items and eye-catching graphics in order to lure more people to your booth. A trade show display booth needs to be striking. Make sure it sends out a clear and compelling message to your target market in order to get their attention. You need to create a buzz and ensure your trade show exhibit is captivating while it conveys details about the goods and services you are conveying. Unique trade show displays can draw traffic and earn more prospects. For the best ROI, have a plan to manage your leads and prospects even when the trade show is over. Contact The Exhibit Source for more information on effective trade show displays and strategic promotional activity. New trade show exhibits can be an expensive but worthwhile investment. But there is another alternative for businesses that want to reap the benefits of trade show marketing. Trade show exhibit rentals are a less expensive option that provides the same functionality, creativity, and quality displays. Trade show rentals are cost-effective and allow exhibitors to change the size and style of their display for each trade show in which they participate. 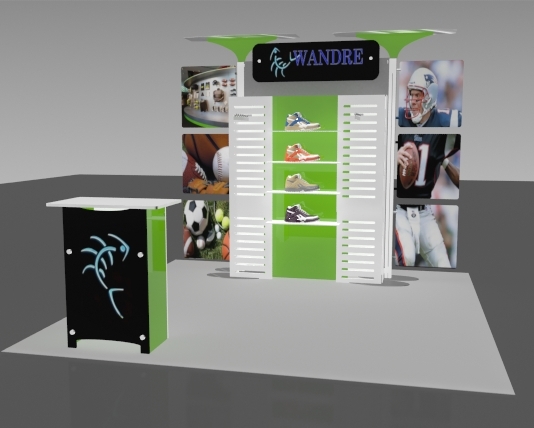 Exhibitors can further customize these displays to match their branding. These displays are fully equipped with necessary accessories to maximize marketing potential and make installation easier at the same time. Because this option is easily affordable, businesses can use more of their marketing budget on staffing and lead follow-up. Trade show exhibit rentals in Boston, MA also enable exhibitors to first test the effectiveness of a certain design prior to deciding to purchase. Contact The Exhibit Source to learn more about trade show rentals. Trade show exhibit booths should be designed with flexibility so that businesses can get maximum use and versatility out of them. Display booths are an investment so they should be able to be used more than once. Trade show exhibit displays in Boston, MA should be customized but flexible booths so exhibitors can make use of them in all types of exhibit marketing events. Trade show exhibit displays allow you to custom design not only the graphics but the structure, which can be flexible enough to be modified when the situation calls for it. The allotted space varies on each trade show floor so it's important that the set-up can be adjusted to fit any space allocated. Not only that, the booth should also be convenient to transport and set-up for less hassle during installation and transit. A strategically designed graphic and structural exhibitmakes an impression. They can also easily convey your brand, products and services. Trade show displays are durable and high-quality any you can make use of them in the company foyer when they are not on display at a show. Contact The Exhibit Source for customized and high quality trade show display setup. Providing a conducive workplace for your employees can motivate them to become more productive everyday at work. It could also inspire them with creative ideas that can help boost your company's performance. Elegant and well-organized corporate interiors can provide that inspiring atmosphere that can help stir up your employee's passion for their work. Corporate interior design can bring out new concepts and innovations from your workforce with the refreshing environment it provides for them. It can also keep them active and focused to their daily tasks. Cutting-edge corporate interiors in Newton, MA can turn boring and passive offices into a more dynamic workstations. Premium materials are used to to make visual displays, bulletin boards and information corners that can absolutely impress both of your employees and customers. Furthermore, customized corporate interiors can also transform reception areas, conference rooms and training centers into a more lively and professional-looking space. And since it is customized, you can use pictures of your staff along with your company activities with pep talk quotes which can constantly remind them that they are valued members of your company. Contact The Exhibit Source to find out more about corporate interiors.